Turns out there’s a bourgeoning underground of Gimpers, though calling them that may get me impaled by scrapbooking implements. Apparently they prefer to call themselves Boondogglers. Of course there’s another camp that refers to the art as Scoubidous. Sounds like a Harry Potter faction. Probably is one. Anyway I also wondered if the Boondogglers and Scoubidousers ever have craft-fair brawls, or travel in armed packs and pick off the occasional old or weakened apostate. Maybe they even have occasional defections to the ‘dark side’, and they knit up elaborate (and incredibly strong - this is plastic lace coated wire) restraining devices for their fallen sisters. Or not. Paddle Fastah! 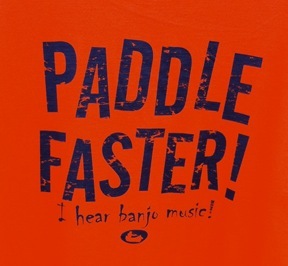 I Hear Banjo Music! 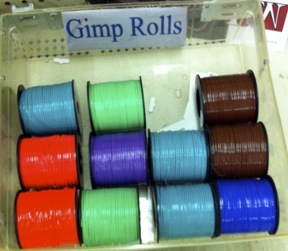 A get well card from a gift/scrapbooking/yarn shop in Maine, which appears to have carried the same stock since 1972. I was stopped dead in my tracks by the plight of Mr. Fluffington however. Shouldn’t puns this bad be illegal? Regardless, it seems he’s had a bit of an run in with a car tire, though I’m sure with enough overindulgence and expensive medical care (no driving over the border to Canada for him - only the highest jacked-up US medical fees will do!) he’ll be purrfectly fine. Or is that pawfectly? 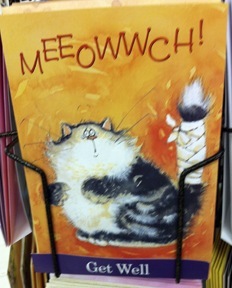 Which reminds me, why aren’t there cards like this that say meowtherf***er? Now that’s a card I would buy without hesitation. And my respect for the store that carried it would rise exponentially too. Greetings - just a quick thank you to the tens of readers who check in reliably, and a welcome to the occasional surfer who stumbles in looking for legitimate Hong Kong product and/or music reviews. Also apologies for the long hiatus - we have just returned from a long visit to the US, and I hope to post some new stuff very soon. I also hope to upgrade my cutting-edge blogware to update the page design, and hopefully allow for implanted videos etc. As always thanks for stopping by and tell your friends and enemies.